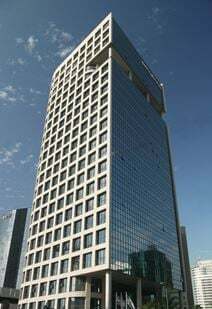 Luxurious office spaces are available to let in a landmark building located in the heart of the famous business district of Tel Aviv. The offices are elegantly decorated and provided with the latest technology solutions to offer you an efficient and professional working environment. Videoconferencing rooms, a restaurant and parking facilities are set within this building, which hosts leading international companies and banks and is well connected to the airport and the motorway. 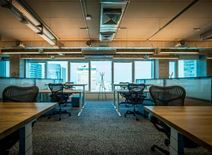 Located in the heart of the city and Tel Aviv"s start-up scene this business centre provides a range of open plan collaborative spaces as well as state-of-the-art offices suitable for two people up to 50+ people. With a striving community this location holds regular events and workshops, ideal for networking. The centre is next to the Noga Gallery of Contemporary Art and Pagoda House. Within the area, there is a number of museums and hotels. Situated in the thriving and vibrant CBD of Tel Aviv, this easily accessible business centre provides a vibrant and unique design, conference rooms, lounges and weekly events. This coworking space combines historical architectural elements with a dynamic industrial style to create a distinct working environment. Set beside towering windows, the large common area is full of sunlight. The Tel Aviv office space is pet-friendly, and many members meet while walking their dogs. In a prestigious and well-known area of Northern Tel Aviv, this business centre boasts an impressive 450 work stations with access to 10 meeting rooms as well as an outdoor area that can hold up to 500 persons. The centre provides a range of excellent services including high speed internet, cleaning services, access to kitchen with complimentary beverages and chill-out spaces. The neighbourhood is ideal for easy access with plenty of public transport and parking options. 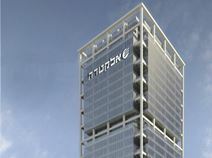 This is a unique opportunity of renting office spaces within one of the most prominent building in Tel Aviv. Exclusively designed and modernly decorated, these offices will definitely enhance the image of your company. The building is excellently connected and close the major attractions and amenities of the city. This centre rubs shoulders with highly esteemed organisations, giving your business a prestigious address with strategic presence. Offering beautiful and spacious workstations in the heart of Tel Aviv, this business centre is a great place for professionals and entrepreneurs. Offices are fully equipped with everything you need and with a selection of bespoke membership options you can make great use of private offices, dedicated desks, hot desks and meeting room access. You will have 24 hour access and kitchens with refreshments. This modern and beautifully designed business space is located in the city centre of Tel Aviv, right beside Sarona and Hashalom train station. The centre is easily accessed using public transport options and parking options can be found nearby. Offices come fully furnished and a range of flexible membership options are available including private offices, hot desking, dedicated desks and flexible membership. With 24 hour access you can work whenever you want. Other services provided include IT support, reception services and meeting room access. Situated in the Nahalat Yitshak district of Tel Aviv, this centre is the perfect workspace solution, with a vibrant selection of custom-designed lounge areas and unlimited coffee and fruit water. Your business can also benefit from meeting rooms and conference facilities for convening collaborative projects or training seminars. Parking is available on-site, plus this space has bike storage - handy if you're cycling into the office. This business centre, found in an iconic tower in the centre of Tel Aviv, Sarona, offers an excellent location for your business. Sarona has become a trendy destination in Tel Aviv, with restored architecture serving as homes to contemporary boutiques, gourmet food and drink places and beautiful gardens to relax in. There are several bakeries nearby offering traditional Israeli delights, along with the TLV Fashion Mall within walking distance where you will find name brand stores. Offering communal hot desks as well as on-person to 15-desk private offices this collaborative workspace in Dubnov is ideal for creatives. The space is within a beautiful building with roof terrace and garden. In addition, the location couldn’t be more convenient for commutes. The centre is a five-minute walk from the train and a five-minute drive from the Ayalon Highway. You can find the Eyewear Museum, the Habima Theatre and the Charles Bronfman Auditorium close by. Offering beautiful and modern office spaces in the heart of Tel Aviv, this business space offers professionals a thriving business community of international members and a range of great facilities. 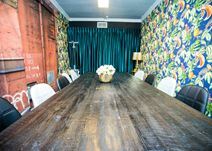 Flexible memberships allow you to use private offices, coworking spaces and meeting rooms. With 24 hour access you can work around the clock. The building offers private phone booths and high security. The centre is found just next to the main train station and parking is offered nearby. This business centre is guaranteed to meet your business needs and provide you with an excellent, professional workspace where you and your business can thrive. The space offers bright and open work spaces which come fully equipped for all your working requirements. Spaces are filled with plenty of natural light and designed to keep you comfortable whilst working efficiently and boosting your productivity. TLV fashion mall is within walking distance and provides plenty of shopping options. Situated in one of the newest buildings in Tel-Aviv, this centre is a 30-minute drive to the airport and is well-connected to the rest of the city. Inside, the fit-out is high quality, well the installed equipment is technologically advanced. Your business can benefit from the centre's administrative and IT support and on-site management team, allowing your operations to flow more efficiently while you focus on the bigger things. 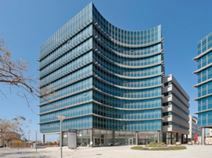 This centre is located in the high-tech district of Hertzelia-Pituach, where you can take advantage of the flexible office solutions on offer. Serviced offices are available for all team sizes, and you can benefit from being able to move your company straight into this space, since all offices come fully-furnished. Coworking space in this centre allows you to blend your ideas seamlessly with those from other industries, on a come-as-you-like basis. Virtual office packages are also available, if you’d rather work on the road, you can arrange to have all your mail delivered here. The centre is beautifully designed, with a large wood-floored, contemporary-styled lobby with modern lighting backed by a skyline motif mural – this is truly the ideal place to have clients visit. A selection of offices is available in an elegant building, which enjoys an excellent location in the IT district of Tel Aviv. These offices are provided with a full range of facilities, including videoconferencing rooms, lounge areas, 24/7 CCTV monitoring and parking facilities. Surrounded by international companies, banks, shopping centres, restaurants, hotels, cinema and fitness club, this building is within walking distance of the railway station. This contemporary new building is located just outside Tel Aviv's city centre in a leading technology business park with fantastic transport links into the centre of the city and beyond. The business centre is on the 7th floor and provides a range of co-working space and private fully furnished and equipped office space. There is a business lounge, 24-hour access, flexible terms and state-of-the-art facilities to use at your disposal. 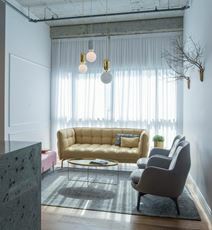 Designed specifically with collaboration in mind this workspace is located on the south side of Tel Aviv making it ideally situated for commuters from the surrounding towns. Private offices complement the shared workbenches and communal lounge areas. Here, your business can also benefit from the centre's IT support, ensuring you stay well connected throughout the day. There are also lots of beautiful gardens within the area which are wonderful for a relaxing walk during your lunch break. Occupying the top three floors of a commercial building overlooking the bustling Ibn Gabiron Street this creative and modern workspace is also part of a complex of art institutions. An ideal location in the heart of Tel Aviv for anyone looking for stylish shared workspace or private offices. The surrounding area is filled with restaurants, cafes, hotels and shops, ideal for relaxing on your lunch break. The space offers modern and contemporary office solutions including private offices, collaborative coworking spaces and virtual office options. Meeting rooms can be booked on a flexible basis and is made easy with the use of an app. Thanks to its central location you will have very easy access to the city of Tel Aviv and other cities nationwide. The centre is found within a walking distance of hotels and shopping areas, benefiting from excellent local amenities. This space offers both co-working and serviced office options, flexible solutions to suit a range of requirements. Here, pricing is all inclusive so you want have any surprises at the end of the month- the price you see is the price you pay. You are also supported by an approachable on-site administration team who can assist with telephone answering, mail handling and greeting your clients! Your business can also benefit from its wonderfully central location. In the midst of Tel Aviv"s start-up scene and offering regular networking events, Pilates classes and massages this holistically-designed business center offers a range of private office space suitable for up to 50+ people as well as hot-desk solutions. Since this center knows this journey requires maximum flexibility, it offers 24/7 access to office space and flexible monthly membership plans. The center has a striving community with regular events, office hours, workshops, massages, yoga and pilates classes and weekly happy hours. Offices are set up to cater for 1 to 100 people. Office suites come fully furnished and on flexible terms. If you're having a 1-1 meeting with a client from afar you don't need to book out a meeting room you can use the soundproof phone booth, this way you know you have the privacy you require. Here, getting around is quick and easy if you travel by car there is the option to park your car on the road outside of the building. If using public transport is more for you there is a bus stop one-minute walk away from the centre itself. A 15-minute walk to the centre of Tel Aviv, this modern office space is close to great transport links and has the goal of providing co-working office space that promotes collaboration and creativity within an inspiring and innovative environment. Your business can benefit from this space's administrative support and IT support on-site, which help your operations run as efficiently as possible. In addition, the immediate vicinity is highly cultured, with three galleries within 5 minutes walk, and several performing arts theatres around the area. With plenty of facilities and amenities offered by the centre, you are guaranteed to have all of your requirements met. The spaces are bright and open, with the option of private work stations or desks in an open collaborative space where you can work alongside the community of entrepreneurs. The centre aims to provide an environment where you can remain productive and work efficiently, with the added bonus of being as comfortable as possible as you work. 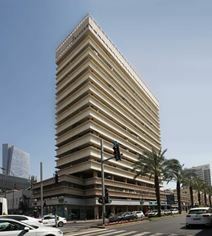 A selection of fully furnished offices is available to let in a modern building in the heart of Tel Aviv. Sophisticatedly decorated and equipped with the latest telecommunication facilities, these offices offer an ideal working environment. It is about 20 to 30 minutes from the airport, making this centre an ideal location for forward-thinking businesses anticipating international clients. In addition, close by, you can find Tmu-na Theater, Givatayim Theatre and beautiful green spaces in which to relax. This attractive business centre is one of the largest co-working spaces in Israel, suitable for businesses that value efficiency, accessibility and upscale services. It includes private areas for large companies, a contemporary design, face recognition for members entering the space, electronic doors opened by mobile app, high adjustable desk and more. Around the building there are plenty places you to eat, drink and enjoy. This business centre located in the heart of Tel Aviv offers both co-working and private offices at affordable rates. The offices come fully furnished and on flexible terms. You can gain access into the offices 24 hours a day, so it is a great place for those working late hours. Here, you are supported by a friendly on-site admin team this team can support you with any questions you may have including; telephone answering, mail handling and greeting your clients. If you meet with clients often, you can make use of the on-site meetings. Found in a prestigious and well-known business park in Netanya's, this business centre offers a range of coworking spaces and private offices. The centre offers a range of in-house services and amenities including a coffee bar, meeting rooms and video conferencing facilities. You can size up or down as required by the space you need, so you're never paying for more room than you need. The railway station can be found only 9 minutes away, giving you easy access to the rest of the city.